My most formative memories have included music. It continues to shape my life both in personal and professional ways, from expressions of dance/choreography to personal meditations. While I was excited by the assignment to develop a music application, I found the task a bit daunting considering the deliverables I needed to fulfill on such a tight timeline (the weekend!). Considering my background and passion for social good, how might I develop a music application that helps others? The following summarizes my discovery process for this inquiry. I designed an application which enables people to learn languages through customized music selections based on current skill level and music playlists. In fusing language lyric exercises with music in a casual learning environment, my goal was to create a digital experience which is fun, engaging, and effortless for users. As this was a solo project, I wore many hats but introduced myself to interviewees and testers as a UX researcher. I was presented with the opportunity to create a standalone music application. From there, I refined the scope of my music application to fit a demographic of people who listen to music and who have actively learned more than one language. I developed an affinity map based on the initial problem statement in order to find trends of the aggregated data. Using the data from the affinity map, I created sketches using a simple sketching notepad and then created low-fidelity designs using the research I attained through user interviews for the target demographic. 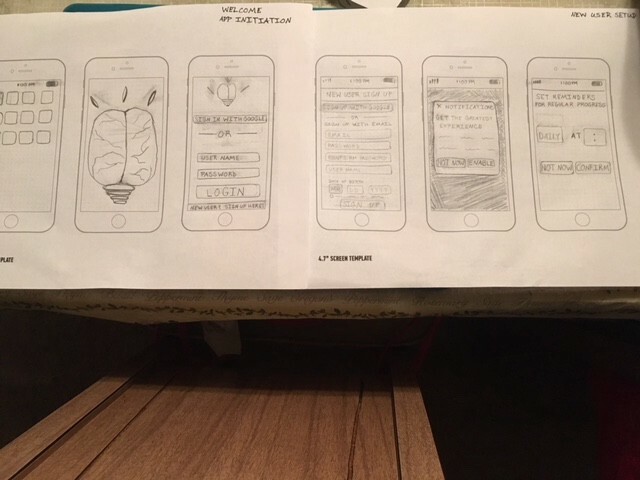 I then uploaded these low-fidelity designs into the Marvel application to conduct usability testing rounds to iterate on the design based on tester responses. Time; I needed to find a group of people to conduct user interviews over the weekend and assist with usability tests of the prototype over the weekend. The initial assumptions I held were that people like programs that are familiar to them, including the common applications which already exist (i.e. Duolingo) which follow a familiar format of vocabulary acquisition, repetition, and rote memorization. I also assumed that nearly everyone listens to music. HOW MIGHT WE CREATE A MUSIC PLATFORM THAT ENGAGES PEOPLE IN LEARNING NEW LANGUAGES? How did you confirm or refine your initial assumptions? Upon conducting user interviews, I discovered that all people that I interviewed used music in the past as a studying tool or used it to listen to languages other than their native one(s). Some trends I learned were that context (atmosphere, environment, time of day) was essential to the type of music they played. Additionally, users reported listening to music nearly daily, either on their phones or on the computer. An interesting insight is that 3 out of the 4 people interviewed preferred to organize their music by playlists. After conducting these initial user research interviews, I also conducted a quick competitive analysis of existing language learning applications and found that programs that were mobile app-based (i.e. Duolingo) relied on repetition and isolated language learning while others that included songs as part of their learning (i.e. Earworm) were mostly desktop-dependent. 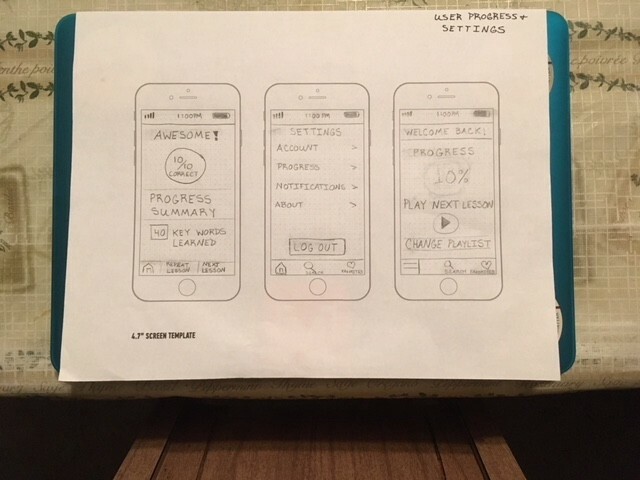 In designing my initial sketches, I wanted to provide users with a familiar designs for music applications (i.e. Spotify) and developed two user persons: that of the a new user and another as an existing user checking their progress on a language lesson. I set reminders and notifications so that the application can help users form regular habits around using the app, which is essential for language learning. I created login screens for easy sign-up or using traditional sign-up through e-mail. The main page on the application had a scrolling carousel of music to choose from by situational playlists already pre-curated (Travel, “It’s Complicated”) and Artists (Celia Cruz, Manu Chao, Aventura, in this example). New users would select their skill level and music playlist or artist preference. Clicking on one of the songs in a playlist would begin the lesson, with lyrics displayed in the song’s language (i.e. Spanish). When the song finishes, the lesson will test the user based on the lyrics that were displayed. After developing the initial sketches, I conducted 3 usability tests with 5 people to answer the main questions: how do users find the flow of this app and how do they find the learning experience on the application? During the two initial tests, users reported generally enjoying the flow of the sign up and song selection process. They also noted that they liked having playlists to choose from and the lessons were easy to understand. Users reported that some improvements could be make for tracking progress within the app, creating separate sign-in processes for new and existing users, and developing the button functions to make sure each button that was pressed worked. I took this feedback into designing the final lo-fi prototype in Marvel. The link to my prototype can be found here. I think my workstyle lends itself to listening carefully to the behaviors that motivate people and incorporating that feedback into developing tools which would complement their lifestyles. 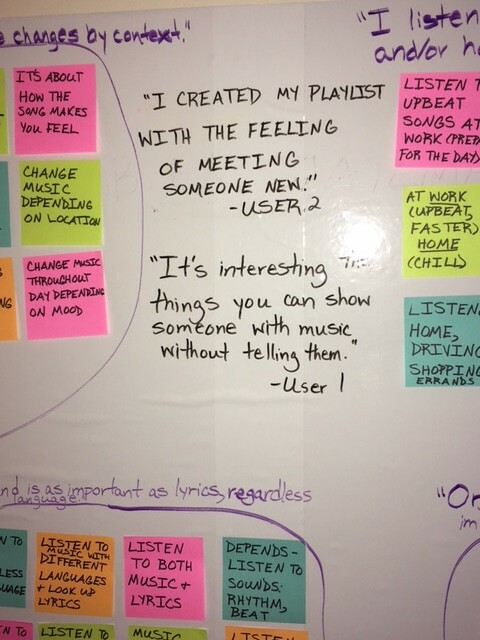 In conducting both my user research and usability testing outside of the classroom environment, it was important for me to stay focused on the minimum viable product I needed to make sure curious about the application, instead of including all of the “bells and whistles” users came to expect from similar music applications. 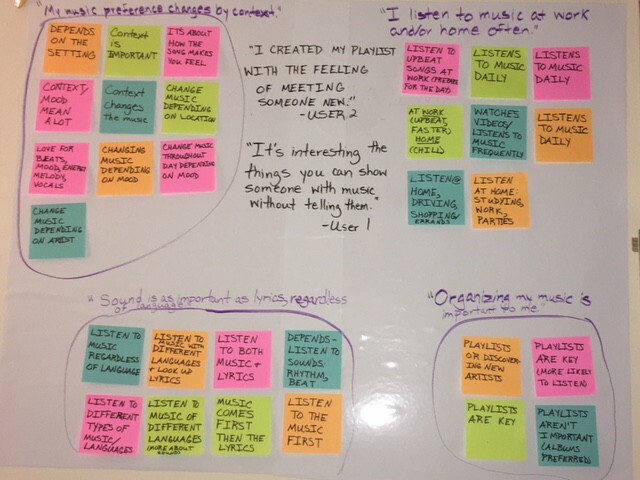 Overall, this process really informed me about the relationships people have with music, language, and learning and I look forward to watching this prototype evolve in later stages.